A letter supposedly sent by Thai fascist organisation, the "Democrat" Party-linked PDRC, has emerged that demands Thai university management only display pro-PDRC banners and engage in pro-PDRC activity. The copy of the letter I have received is addressed to the Deputy Dean of the Engineering Faculty at Bangkok's prestigious Chulalongkorn University. Whilst there is no explicit threat in the letter there is certainly an implied one as the PDRC exhorts the university to act in defence of "King, nation and religion" in order to support the unseating of Thailand's democratically-mandated, legally-constituted and popular Prime Minister, Yingluck Shinawatra. 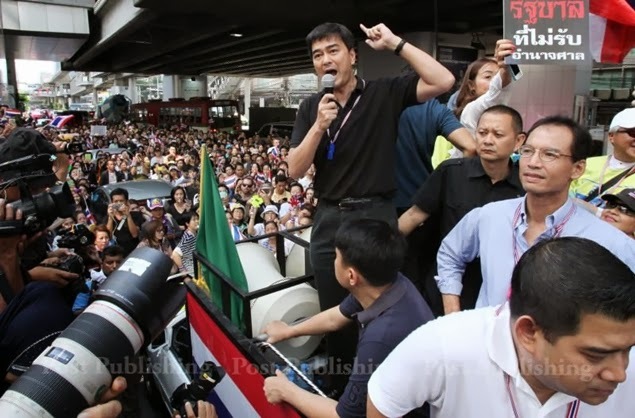 It is also clear that the PDRC are now intent on smearing the pro-democracy movement via false claims that the UDD leadership is "anti-monarchy" - similar claims have been used previously by Thai fascist movements to rationalise bloody massacres of pro-democracy activists. The PDRC now seem determined to pressure - with implied threats if necessary - even Thai universities to follow their aggressive anti-democracy platform. A rough translation of the letter follows whilst a pdf copy of the original letter is at the bottom on this post. PDRC will hold rally on the day that the CC will hand down the verdict to remove YL in order to express our will that we want the neutral govt to resolve the conflicts in Thailand, topple taksin regime and reform the country before election. 1. Use all kind of university’s media to make people love and uphold the nation, religion and the King as well as advertise the PDRC movement that we fight for these three pillars of the country - and we are especially opposed to the anti-monarchy movement. 2. Set up the unit to distribute UDD leadership’s anti-monarchy speech in order to destroy legitimacy of UDD and supporters of caretaker govt. 3. Invite students, lecturers and workers who are under your command to join PDRC movement by telling them that this is being done to protect the nation, religion and the King as well as opposing corruption in the caretaker govt. 4. Put up the banners supporting PDRC inside your university and only advertise PDRC’s news.